Find your perfect condo in the listings of Fulton River District homes for sale below. Located just beyond River North between the Chicago River and the Kennedy Expressway, the Fulton River District in West Loop is a mixed-use collection of neighborhoods that are bursting with energy and opportunity. The Fulton River District is a commuter's paradise. 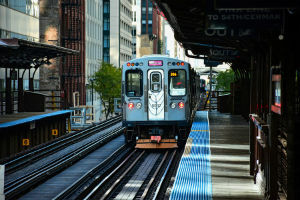 Many of Chicago's major transportation routes converge into this one community before heading across the river into the downtown core by means of West Grand Avenue or West Kinzie Street bridges. If you're looking for a community that's the perfect fusion of downtown energy, a historic past, and a relaxed yet trendy vibe, then these condos for sale in Fulton River District are not to be missed. Both the commercial and residential Fulton River District real estate markets are hugely in demand right now. What was once a major commercial, industrial, and manufacturing hotspot like much of the West Loop, has been transformed into a hip, mixed-use area that's primarily home to high and low-rise condominiums and converted loft spaces. Those with a discerning preference for industrial chic will adore the gritty brick facades and older brickwork that's reminiscent of the community's diverse past. The Fulton River District is home to a growing number of condos and townhomes to help meet the considerable market demand for homes in these desirable neighborhoods, and there's something for every preference. Whether you're looking to pair your refined tastes with one of the exquisite homes overlooking the waterfront in Kinzie, or are looking to score the perfect walk-out townhome to suit your always-on-the-go needs lifestyle, it's all here. Those living in the Fulton River District love the great walkability and transit options here. Nearly every building will include secured parking, but with grocery stores and boutique stores just around the corner, you'll rarely have to use it. Just some of the main public transit hubs that transect the Fulton River District are the Chicago Transit Authority's Blue, Green, and Pink subway lines, as well as the Metra commuter train, departing from the Ogilive Transportation Center with service to the outer reaches of the city and beyond. You'll also find quite a few Divvy bikeshare stations and multiple bike storage facilities throughout the community to help make sustainable transportation more accessible for everyone. If you fancy yourself a foodie at heart, you'll love the selection of trendy places to eat in the district. From traditional North American eats to contemporary Italian cuisine and everything in between. With more than 30 restaurants and taverns to choose from, many of which are just a short walk from your home, your choice is anything but limited. Learn more about the Fulton River District real estate market today. Get in touch with Andreas Holder online or by phone at 312-893-3560 to schedule a tour or request more information about homes in the West Loop.